Milan 08: industrial designer Konstantin Grcic will launch Myto, a new cantilevered chair for design brand Plank at the Triennale Design Museum in Milan next month. 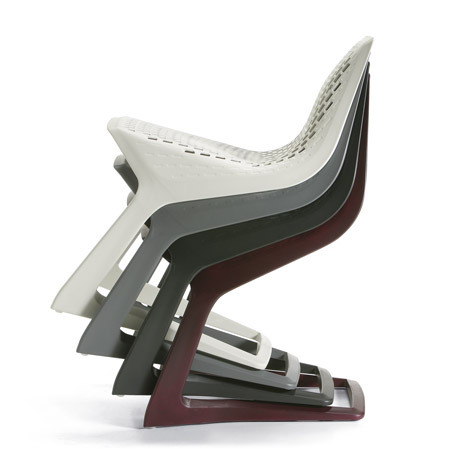 The chair is made of Ultradur High Speed, an advanced engineering plastic made by chemical manufacturer BASF. BASF have commissioned Grcic to design an installation at the museum to launch the chair. "The exhibition takes the visitor to an imaginary laboratory that is inspired by original BASF work environments and will focus on the design and development process of the project," says Grcic's office. "Design models, images, videos and pictures of the MYTO project offer a transparent documentation and explanation of the ‘making of’." Photos are by Plank Collezioni. The German designer Konstantin Grcic used the typology of the cantilever chair as a reference for MYTO as the original cantilever chair is synonymous with the beginning of modern furniture design. He designed what is – in terms of its formal construction – a unique chair by fully utilizing the extraordinary properties of the used material. Konstantin Grcic managed to re-interpret the subject of the cantilever chair with Ultradur® High Speed. The particular strength and high flowabiliy of the PBT plastic called Ultradur ® High Speed enable a unique transition from a thick to a thin cross-section. The chair which is produced as a monoblock presents a strikingly stable frame into which the seat and the backrest fit perfectly with their net-like perforations. Right from the beginning, KGID and BASF involved the Italian furniture company Plank to produce the chair. BASF was the initiator and the driving force throughout the entire process with its expertise regarding the innovative material. The first design for the chair in which the material properties were optimally utilized was created within a relatively short time. "Normally it would take around two to three years to develop a chair" says Grcic. But with the constructive dialog among those involved in the project, the chair will be on the market after a little more than one year of planning and production. "This level of efficiency is unprecedented. To implement projects within a group of experts in such a short time is visionary in the field of design," reckons Grcic. MYTO was presented for the first time on the BASF stand at K 2007, the world's biggest trade fair for the plastics industry. The fair took place from 24th of October until 31st of October in Duesseldorf, Germany. The official launch of the chair is scheduled for the Milan furniture fair 2008 after finalisation of the design and development process.